March 22, 2009 by Alphageek in "alphageek bourbon hdnet television high definition def lost pvr callibration"
The other night, Mrs. Alphageek and I were watching Lost on the PVR. You do have and use a PVR, right? The show has been dealing a lot with time travel lately. In the show, a character tries to communicate with someone in another time. This led me to pause the PVR and tell Mrs. Alphageek how I would communicate with her if I were ever stuck in a time paradox. She gave me the look you probably have on your face right now. That look says "what the heck is wrong with you"? I say one needs to be prepared. Please do not ask the code I worked out because it needs to be secret and only Mrs. Alphageek knows. This led to a discussion of other signs I might be a geek, as if the two engineering degrees were not enough. Another sign is the picture with this entry. I was watching tv and stumbled across HDnet running a test pattern. 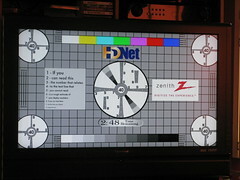 This test pattern is important because you can use it to check the calibration of a high definition tv. I decided to record the six minute test pattern, so that I would always have it. Finally, I used the internet to find a new telephone number for the fine folks at XM when I was having trouble with their customer service. I was on the phone 47 minutes the first time and that call did no good. I took ten minutes, searched the internet, and found a new number for XM. I used the new telephone number to call and make the changes I needed in about five minutes. For you liberal arts majors, I saved 32 minutes! Mrs. Alphageek has not yet wiped that strange look off of her face. I wonder what look she will have after reading this article? "alphageek bourbon hdnet television high definition def lost pvr callibration"